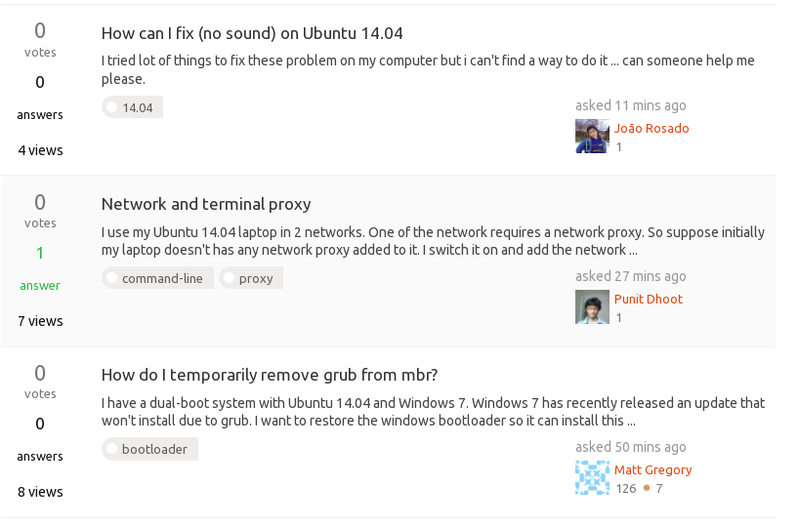 As you can see, Ask Ubuntu community site got a slight design update today. I have moved site's CSS to a newly refactor LESS system, so it's more maintainable for us to fix SE network CSS bugs globally going on forward. I've standardized some common site elements and UI conventions. 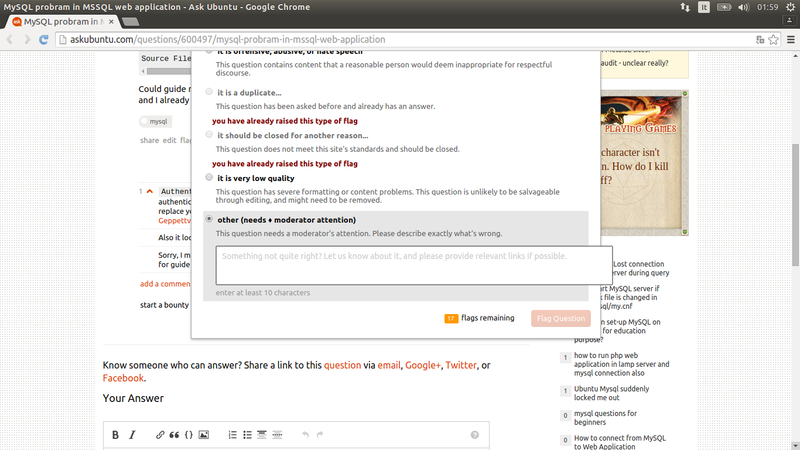 For example, only accepted answers on the home page and question list page get a more prominent treatment. 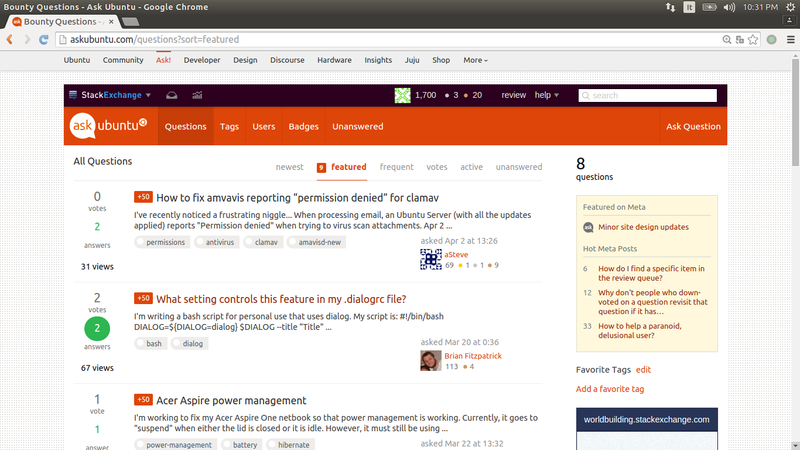 I have removed the Ubuntu orange color for unanswered background color. (The orange was a bit over used before). I try to keep the overall look and feel the same as before. The new changes will make it easier for us launch new site features as well. Site's logo and icons are now in SVG for retina support! This update should retro-actively fix most of the old CSS bugs. If you see any new ones, or old ones not being fixed, please let me know! 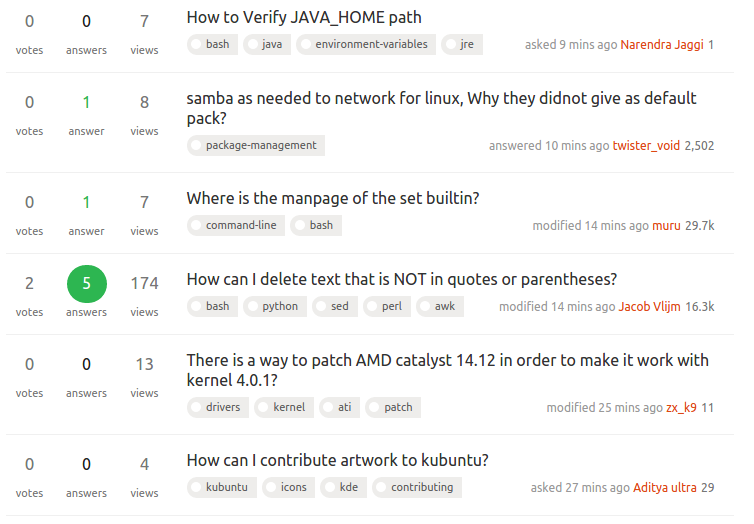 The middle of the three questions shown above is highlighted because it is tagged with one of my favorite tags. Assuming this is not a question of my screen being miscalibrated, I'm sure you agree that the highlight is almost invisible. The normal background is pure white (#ffffff) and the highlight is #fafafa which is really too similar. Please make this more visible. Do I need new glasses or is the word answer blurry? Perhaps there's not enough contrast between the foreground green and the background? Or is it an anti-aliasing issue? Either way, could it be fixed please? Posting a screenshot as an "anwser" as an example of the blue hightlight. I would consider changing the color to match the rest of the site. Mod-only flags on meta are now red, instead of orange with white text like it was. Aesthetically it clashes. Font size was reduced, makes it a lot harder to read on high-res screens. This font size reduction is only on the pages here - the actual 'Question size' on the font doesn't change one layer down on the actual questions. No green circle around "2 answers". Affects aesthetics, less so than readability, but it looks garish as is now. Uniformity needs to give way to aesthetics. While most of my complaints here are aesthetic in nature, you can have 'uniformity' but also include aesthetics with respect to the site theme/design. The number of answers circle seems slightly oval (38x40px), and the number is slightly off centre. 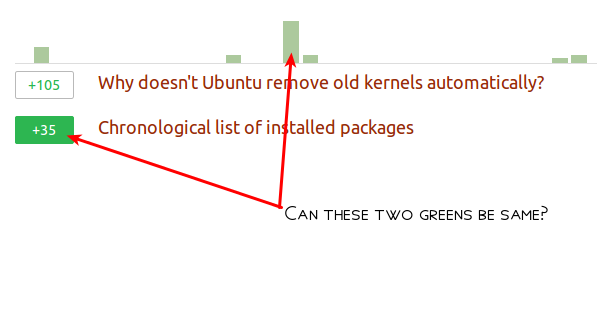 To me, the tickmark under accepted answer votes, does not look to be properly centered within the circle. Maybe the tickmark should be just a little bit towards left. The background colour used for the flags in the flag queue is gone which makes the flags hard to read. Could you darken that a bit more, closer to what it used to be? 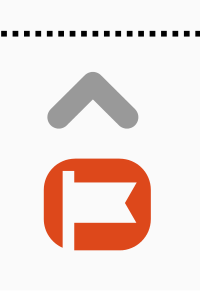 Another issue I've run into is the contrast between the orange squares and the number they hold makes it really hard to read (this one is quite hard to show in a screenshot, but hopefully it gets the idea across). I'm personally fond of the colour used but I'm afraid something is going to have to be changed to keep those more readable. Thanks for all the awesome work you do around here Jin! The font size of the body text in the questions and answers looks larger than it was before on my computer. The line spacing of the body text looks smaller than it was before. The combination of these two factors makes the text look too squeezed together. Either increasing the line spacing, decreasing the font size or both together would improve the readability. I really can't help the fact that I like the overall changes. I noticed a few minor changes/improvements were made since this post appeared. Please go back to chunkier upvotes. I used to try and do my bit by giving priority to those questions which have no answer at all, and I could see them very very easily when they had that orange circle. Now it's very hard to easily spot them, and I don't think the argument "too much orange color used in the website" can justify lack of a stronger emphasis for 0 answer questions. For example, only the number 0 (without a circle) could be made red, or a light grey circle could be used, etc. This problem, I think, will have an adverse effect on the overall number of answers as it puts off people like me. reputation shows -1 in blue, but achievements shows +10 I'm not certain this is related to the design update, but I couldn't find any related questions so I thought it might be. We are using pretty quotes in titles here and in Unix & Linux, where it's been pointed out for some time. I get that you wish to clean up code and make things prettier, but please "fix" that which is broken. 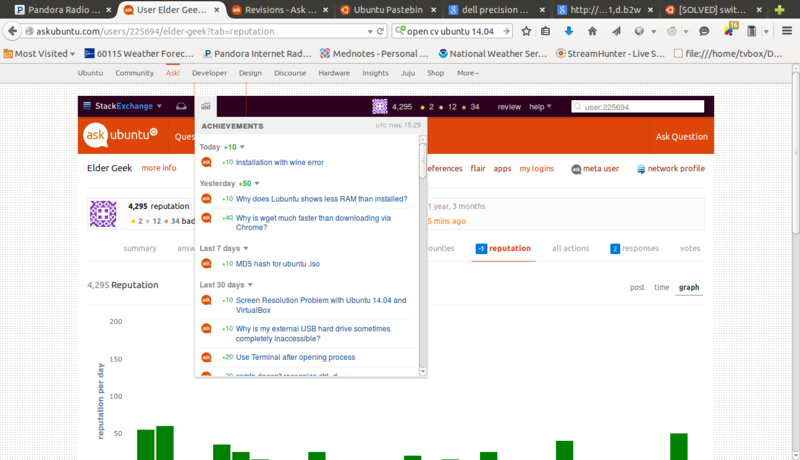 ETA on new User Activity page for non-Meta.SE sites? How shall we report bugs in the new design?